Ah, Australia. I love Australia. I want to go there someday. I have several Haiku Challenge members from Australia and one even is part of my Team on my LitWorldInterviews site as a book reviewer. She lives outside Sydney and is a law professor and therapist. She would need to be multi skilled in that profession 🙂 the inner suburbs of Sydney are lovely. Chinese gardens, coves, outdoor cinemas, harbour cruises. What is Haiku Challenge? It’s a weekly poetry challenge I hold. It is now on its 60th week. It came out at 9AM New York time. And around 40 bloggers/poets join in each week with at least 50 being involved. The post has links for instructions and everything. 🙂 The haiku here is for that challenge. Visit a place called Alice Springs… There was a PBS series ages ago called: A Town Like Alice and it was all about that time, a place I have always wanted to visit. 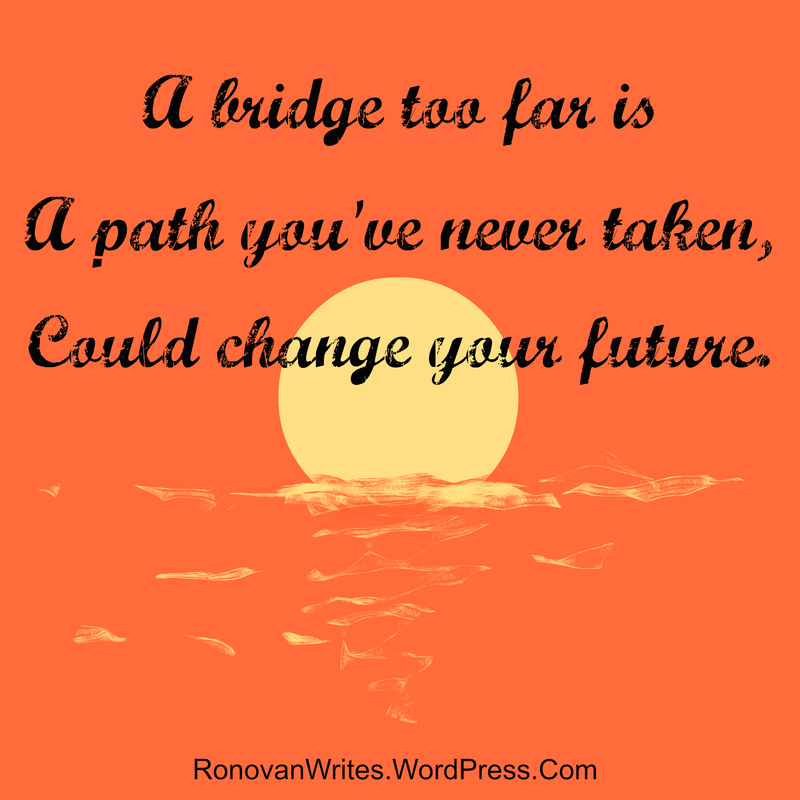 A perfect haiku statement Ron, its always worth that extra step to get to your perfect place! Is it egotistical to see yourself in the poem? I’m feeling better than I have in a long time. So thankful! Still I wonder about the bridge too far. Try not to overthing; enjoy each moment of each day; let the future take care of itself. This is great Ron, a moving haiku about love, and what we will do and how far we will travel to find it. I found my true love at eighteen! I didn’t travel far at all he lived in the same city as me! We were very young, younger than my eldest daughter is now! That’s quite a thought. There have been moments when I thought EEK, I’m too young to settle down! And it was rocky sometimes. I think my advice to young people in similar circumstance would be this: if you find the right person don’t let them go, you might never find someone quite like that again.